As the anniversary of meeting Z has passed by, I have found myself looking back at photos of our first days together. She changed me so quickly. It's hard not to be changed by the baby woman who sits on your lap for every meal and sleeps next to you every night, trusting you despite not knowing you very well. I realized suddenly that a lot of messages I'd received about what it meant to be a woman and to have a woman's body were things I didn't want my daughter to receive. If she heard them, I wanted her to know that they were not true, that she was her own person and she was entitled to have her own thoughts, her own opinions, and her own autonomy over her own body. From the first day I saw Z's photo, I felt a powerful urge to protect her. It's why I bought an open ended plane ticket when we flew over. I wasn't going to leave her after I'd met her. I was going to take care of her in whatever way I was allowed until we could take her home with us. All these things that I realized I wanted to teach her, about herself and the world around her, about who to come to when you are hurt and who will always fight for you, I wanted to start teaching her right away. I hope I have done a good job teaching both my daughters, every day, that they do not owe anyone anything that they do not feel they would like to give. They do not exist for someone else's pleasure. They do not need to look a certain way or wear certain things or put up with someone treating them inappropriately or making inappropriate remarks. And they absolutely do not have the responsibility to make sure that some man's future doesn't get ruined if he violates a woman. I think you can guess how I feel about the Kavanaugh vote today. I will have more to say about this. But for now you should know that I believe women. I am a woman who has lived with this culture that values the comfort of men above the very real trauma caused to women. I know how it goes. I know all the excuses. I know the denials. And I do not want a man who very well may have assaulted multiple women to be the one who interprets the laws that will affect women. The stakes are too high. We shouldn't take chances. Eight years ago today, we rode in a van that pulled into a driveway where a little girl wearing a green and pink dress and red, shiny shoes stood waiting for us. I still wish she hadn't been waiting alone. But I got out of that van soon enough, and she allowed me to pick her up (brave girl), and she wasn't waiting or alone anymore. The rest is our own personal family history, of which some details will always stay between just us. But that was the moment that I tag as the one that I became a mother, that moment that she allowed me to lift her into my arms and introduce myself. It has been an extraordinary pleasure to be her mother these eight years. I am lucky, and I know it. I wouldn't want anyone else as my first child, and that's a fact. I feel like I won the lottery. She is diligent and kind and has a mind which will not be satisfied until it knows every possible thing there is to know. She reads voraciously, works hard at the things which don't come easy to her, can cook things that no one has taught her to cook if she just gives it a go a few times. She always gets into the bath late and always gets away with it. She puts up with a lot of nonsense from the rest of the family. Letting some small things slide is only fair. I love her endlessly. I have from the beginning. Eight years. What a privilege. I got home late from a meeting and am sitting here waiting for my hair to dry enough that it won't look like crazy town in the morning if I sleep on it. I'm thinking about where I was on this night eight years ago. 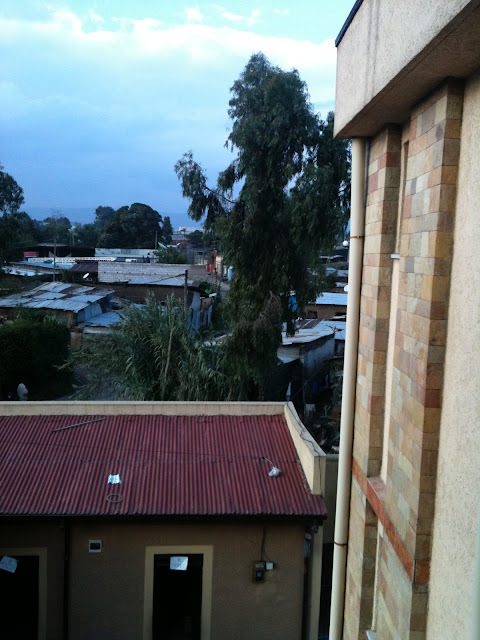 I was in a city where I'd never been before, waiting to become a mother. I remember the relief of landing and knowing that I was finally in the same place as the little girl whose picture I'd been staring at for the past three and a half months. I wondered if she was asleep already. I wondered if she knew we were coming. I wondered if she felt nervous or scared about meeting us. I felt nervous about meeting her. Oh, boy did I. But I couldn't wait. I wanted to mother her so badly. From the first time I saw her eyes staring out from that picture, I wanted to take care of her. 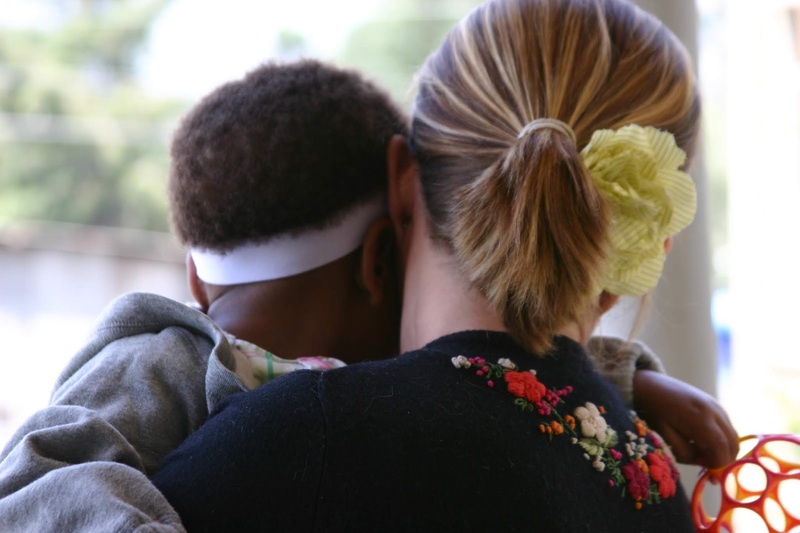 Over that summer, while we prepared to travel, the stories started coming out about corrupt adoptions, about children being taken from parents without the parents really understanding what adoption meant. I wondered if taking care of her might mean that we would just get her back to where she belonged, and that it wouldn't be with us. There was so much that we didn't know. Now we know everything that we could possibly find out in the eight intervening years. And we know her. I feel indescribably grateful for these eight years with such an incredible person. I will have more to say about that tomorrow, when I post my requisite schmaltzy post about being her mother for eight whole years. But for now, I remember that night eight years ago. I remember what it felt like to be on the cusp of knowing her. I remember my last night of going to sleep without checking on someone before laying my head on my own pillow. Parenting can be stressful. It is not a walk in the park, and we have willingly taken on some additional work that comes with building our family in the way we have. But I don't miss not being a parent. It has changed me in the best and hardest ways, and I know that I am so very lucky that this is my life. It's DNA! Well, not actual DNA, obviously. 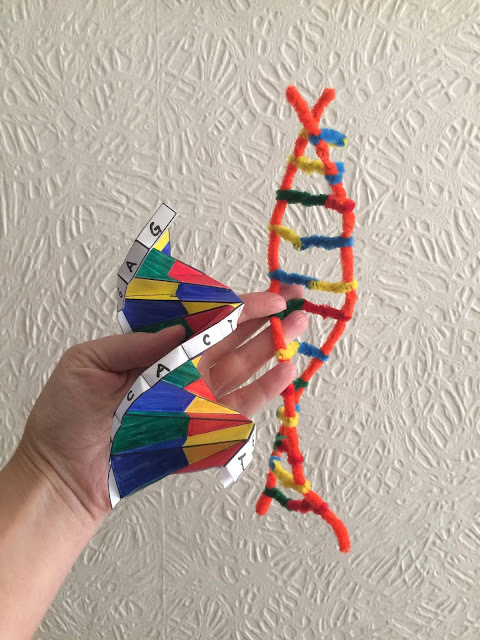 DNA models, one origami style and one made of pipe cleaners, because if you can't make it out of pipe cleaners, is it actually a homeschool craft? Perhaps not. My kids have been making strange noises all evening, and it's the second evening in a row that J had a meeting to attend which left me alone through the dinner and bath hours, so I'll admit my brain is fried, and I really have little to share. Even now, with J at home and putting the kids to bed, one of my children is insisting on hooting like an owl and laughing like a maniac, and I still can't focus. It's very distracting. I'm quite sure I had something of note to write that is not about my homeschool craft efforts, but alas, it is not going to get typed up tonight. For now, please enjoy my craft accomplishments. Should you want to make your own DNA, click here to get to the website where I found instructions for origami DNA, or just google "pipe cleaner DNA" and look at the variety of forms to copy. I thought this would be a dull project, but it's actually been quite fun. Since we've been homeschoolers, I've loved Mondays. I realize that's a bit weird, but like my kids, I do best when I'm settled into a routine, and weekends are often a little bit too random for my comfort. They're also often really busy, and so getting back to Monday, when we don't have to leave the house early and can just get down to our own homeschool and life business, feels like a relief. Or it did. But now Monday has betrayed me. Now Monday is full. Too full. We have a neighbor visit, and E's ballet class is too late for her to wait to eat dinner afterwards. So I scramble to get our school routine done, to get to our neighbor's house to visit, to get dinner done, to get E changed into her ballet uniform, to get water bottles and snacks into my bag (because heaven forbid that we would go an hour and a half without eating), to get both girls onto their scooters and half a mile down the pavement to where the ballet class is held, to get E out of street shoes and into ballet shoes and into class, to get all our stuff corralled into a manageable space. That reads as an enormous run on sentence because that's what my life feels like on Mondays. And I didn't even include the parts where I am doing laundry and putting away food that shouldn't be left out and ordering things from Amazon and composing messages to send a continent away through someone who speaks two languages that I don't. 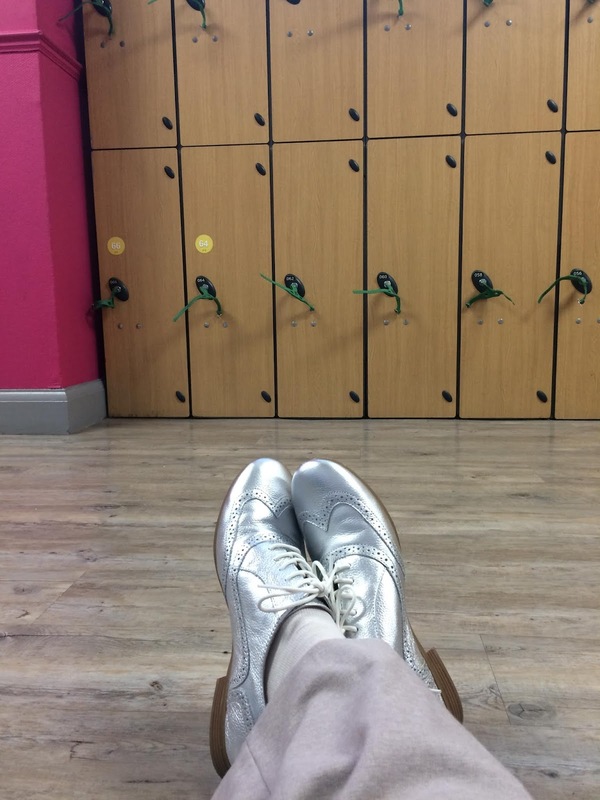 This part, that you see above, where I am sitting on the floor during E's ballet class, is a small moment to breathe while I admire my new silver brogues. Except that the grocery list needs to be amended and there's a message I forgot to reply to two weeks ago, I forgot to get toothpaste, and oh, Monday, why are you treating me like this??? Because after this time sitting on the floor amending the grocery list and replying to messages, I'm going to get the kids back home and probably give them a second dinner and make sure they take baths and brush their teeth and get into bed. It feels endless. Monday is being mean to me. I know I just need to get used to the new Monday routine. It won't always be this bad. It just feels like such a shock after these blissful years. People grow and change, and their needs grow and change, and Monday and I can no longer have the relationship we once did. We aren't going to be BFFs anymore. We'll be acquaintances. Maybe someday we will like each other again. For now we will just have to tolerate each other's presence. I'll find a new BFF. Maybe, like so many others, I will decide to love Friday. That might work. I will wear a badge that says TGIF. I will say things about the weekend. Monday will be jealous. Maybe then it will treat me right again. As much as we love homeschooling and are so grateful that it's possible for us to do this for our kids, I would be lying if I said it wasn't hard sometimes. Here's a brief list of things I find to be hard. There are just five of them, which isn't that bad, right? 2. Working really, really hard every day to educate my kids, but being told that I don't work. Or having people assume that because I am at home with my kids, I have loads of extra time to do favors for others. Like most parents who work during the hours that children are usually at school, I am busy from the moment I wake up until I get into bed at night. I am happy to do my bit for various projects at church or within our community, and I have built in time to serve others who are in need, but my days are not filled with endless free time. Essentially, I am a full time private tutor for two children. I just don't get paid for it. It's still work, even if no money changes hands. 3. And speaking of money, it is sometimes hard to accept that I am not bringing in any income regularly. I do hope this will change at some point, that I will find just the right opportunity to add to the family finances, but for now, it's just little bits here and there, and surveys that pay in gift cards. When we run a bit short or I'm wrestling with the budget to accommodate an unexpected expense, I have to give myself a little pep talk, reminding myself why we are doing this, and that it is worth it. 4. That our house is usually messier (and dirtier!) than I want it to be. While we aren't here all day, every day, we spend more time at home than families whose kids are in school. This means we eat more meals here, and the kids play more here, and all of the school materials the kids use are here. There is always a mess of some kind, somewhere. There are also more opportunities for my children to change clothes and put entire outfits that are really quite clean into the dirty laundry basket. 5. Managing my needs as an introvert and Highly Sensitive Person (it's a real thing - not just me being a delicate flower) with the realities of homeschool life. We often need to be quite social, and at some events we are meeting lots of new people at once. At home, there is very often at least one child and possibly multiple cats in my personal space. Sometimes my children are unbearably loud. I have accepted that during this season of my life, I will not get as much introvert time as I'd prefer or as is optimal, and sometimes I will be completely overstimulated. It can be tricky to make sure that I get enough time and space to myself, but I must figure out how to get the minimum so that my mental health and patience level remain strong for the work that I am doing. As it stands now, all these hard things are manageable. If they weren't, we'd have to re-evaluate our choices for our family. But for now, we're good. *Please see note below regarding the map in this photo. At this point in our homeschool life, I would not say that we use a particular curriculum. We do Charlotte Mason style education, which is literature based. 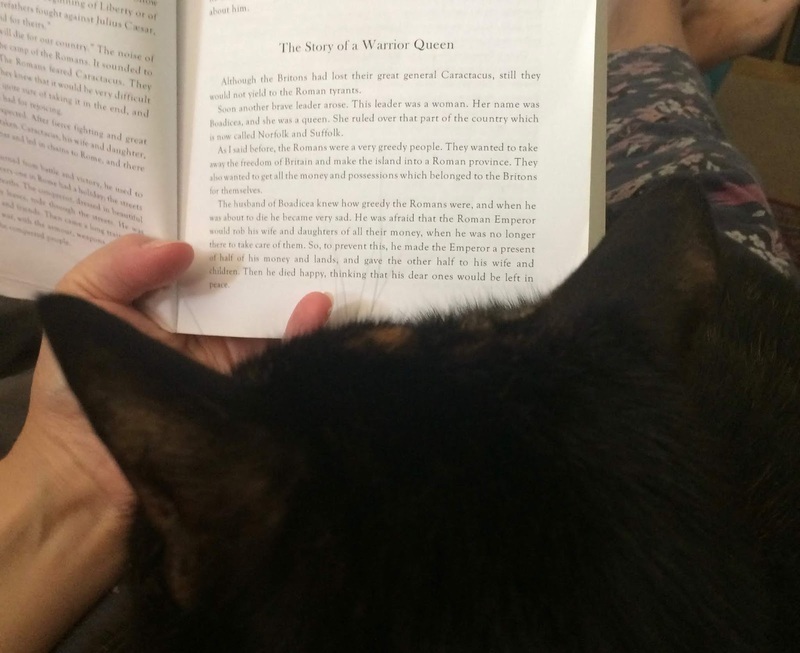 We began by using Ambleside Online curriculum pretty closely to the way it is recommended, but along the way I found that I had some major issues with some of the books that were recommended, and the reading schedules didn't work for us. Rather than dividing up the readings so that some books had only one chapter read each week, it seemed to work better to read a chapter a day until we were done with a book, then move on to the next. I also thought it was sometimes simply too much to get done in a week, so I pared down what we did. The other thing that didn't work for us is nature journaling. If you know any Charlotte Mason homeschooling families, you may think this is the main thing. But for us, it's not. It actually made Z cry. So we no longer go out specifically to study nature. I have a British bird guide, binoculars, and a magnifying glass in a pouch that we can bring with us if we are going to be in a park or other nature type setting. We read lots of books about animals and nature, and it's fantastic when we can find things we've read about when we are out and about. But we just don't do a lot of focused nature study. It's not our thing. In terms of the major issues with the books that I mentioned above, I think it will suffice to say that the N word and a fair bit of racist caricature** was included in one of the books recommended for Year One, as well as a book about George Washington which included mention of happy slaves. So NOPE, we are not going to follow those recommendations. I also noticed that the selection of books was very white centric. Even some of the books about persons of color or of other cultures were written by white people of European descent. (Honestly, Rudyard Kipling does not need to have so many books on the list.) So I use the Ambleside curriculum as a guide for teaching history at a particular pace and incorporating other Charlotte Mason principles, and I select books from their lists that are truly good and wonderful "living books," but at this time we probably only use 30% of the recommended books and choose our own for the other 70%. We've also worked into a little light unschooling. When one of our kids expresses an interest in something that comes up in one of our readings, I will order materials to explore the topic further. Z was really interested in both world wars, so we got more books that would help us learn more about that. I also often order companion books. For example, there's a book called The World of Anne Frank which is an excellent reference to use along with The Diary of a Young Girl. I also have a pretty large Amazon wish list of books and other homeschool materials that I know my kids would like and use, that I'd like to keep around for them to use as they please. To really make learning come alive, we make use of the many museums in London. Many of them are free to enter. We also have had a Historic Royal Palaces membership for the past few years, and it has proved to be more than worth the annual fee (though it's not cheap). As our kids get older and we can spend days out more easily, I will be checking out other memberships which may be useful to us, such as National Trust. It is also very helpful to have a Family& Friends Railcard so we can save on fares to sites outside London, and we've held one of those for most of the time we've lived here in London. We also use many online resources and apps for learning. Z is using the Duolingo app, and E uses the Gus French app. Z used the Reading Raven app when she was learning to read, and E now uses that and also Teach Your Monster to Read. Z is using TTRS for typing and spelling lessons, and we use a lot of the Nessy resources as needed. We will be using Nessy Numbers for both girls this year, and Z will use Writing Beach. If one of the girls finds an educational app that they'd like to have, I usually say yes. The Duck Duck Moose ones in particular have been great for E.
I'm sure I'm forgetting quite a lot of what we use, but that's the basic information. I prefer to keep things somewhat structured overall. I like having a framework to start with, and we can be flexible within that framework. I don't hesitate to change things up if something isn't working for us, if I find that a book I thought would be good has some issues, or if I find a book that's simply better than the one we've used before. So far, so good. *You may notice that the map behind Elvie is a bit problematic, as it's from a time when colonialism was in full swing. I bought it because I wanted a map of Africa, and our kids are Ethiopian, and it is a point of pride for Ethiopians that Ethiopia was never colonised. But I feel now that it is problematic and would like to replace it with a topographical map when budget allows. We use this as a history aid for now and keep an accurate map posted next to it. **Some versions of Just So Stories still include the N word, which I find to be completely unacceptable. We got the Children's Classics version, and I threw it away with the cat litter. I was thinking that I'd post our usual homeschool week, with added activities, but then I realized that we actually run on a two week schedule. We do have some things every week, but there are several things that we only have fortnightly. I also find that the lines between homeschool and other life stuff gets blurred, so not all of this is directly related to the girls' education. There's not really a separation between what is part of the homeschool lifestyle and what is not. I work to balance it all and find a good rhythm for our family. So here's a breakdown of what a typical week looks like and what is weekly as opposed to fortnightly. I'm including mention of some of my usual chores so you can see how I fit those in. Monday - We do our usual routine, and then we visit our neighbor. E has ballet in the evening, so this is the one day we do not eat together, as her class is so late that she needs a full meal beforehand, or she wouldn't get through it in a good humor. So after the neighbor visit, I make and serve dinner, and then E gets ready for ballet, and we head out. I do clothing laundry on Mondays, or at least it gets washed and dried/hung out to dry. It rarely gets folded on this day because this is one of the days that we've got two activities. (I usually try to keep it to one per day, but it doesn't always work out.) Our neighbor visit takes an hour, and ballet takes upwards of an hour and a half, including transit time, and that uses up most of the extra time in our day. Tuesday - We do our usual routine, and I try to do an extra project or two that I've got on my list before taking Z to her violin lesson in the early evening. If we have our homeschool meet up the next day, the extra project I work on is usually preparing everything we need for the meet up. I need to make the example for the craft project and gather the materials that we take along. On the other Tuesdays, I'll do things like mending clothing, editing and uploading photos to a stock photography app, organizing something (the need for organizing never ends), or...whatever. My list of things to do is long and somewhat weird. If I've not folded laundry on Monday, I do it on Tuesday, unless there's a circumstance that prevents this. 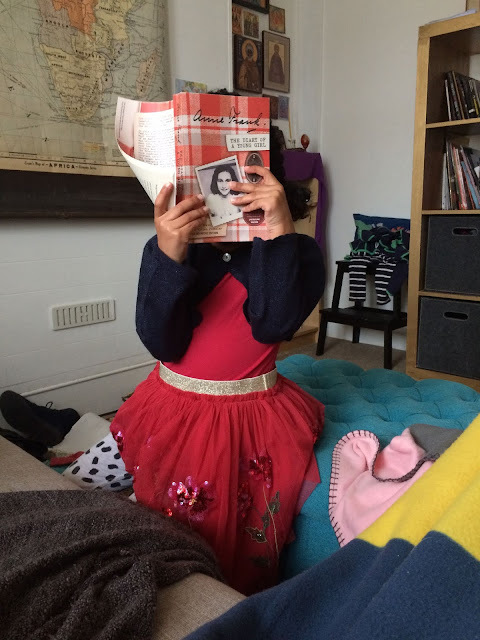 Wednesday - Every two weeks, we have our semi-structured home education meet up on this day. When we have the meet up, we do not do our usual routine. Both girls usually prepare a presentation for the meet up, and so we spend the morning finishing those up. Because I am the one who organizes and facilitates this meet up, we have to take all the supplies for the meet up with us. By the time we've gotten there, set everything up, had the meet up, and gotten everything packed up and home again, I am exhausted. If I feel revived after a snack and a cup of tea, I might do a reading that both girls will enjoy, but otherwise I don't worry about it. On the Wednesdays that we do not have this meet up, I reserve the day to do our usual routine and nothing else. We can all stay in our pajamas if we want. Wednesday night is Minecraft night, so there's preparation for that regardless. Z plays with J, and E can either watch or have some active screen time of her own, but they have to earn this. Both girls have to have all their own things put away in their rooms and around the house, and Z must clean the bathroom, so that keeps them both busy for much of the time they have free after either the meet up or our usual routine. I will either do a project from my list or work on laundry, sometimes both! (How exciting for me, am I right?) From time to time we'll get an invitation to meet with friends on a Wednesday that is not a meet up Wednesday, and we almost always say yes if this happens. Thursday - This is the day I normally arrange for the grocery delivery to arrive, so we get our lessons started after that's shown up and everything has gotten put away. We visit our neighbor on Thursday afternoon, and then we get ready to go meet J at the end of his workday so that he can take the kids with him and I can go for a short run and take dinner to a homeless friend. Z usually cooks our dinner on this night; we nearly always have breakfast for dinner on Thursdays, and she's really good at preparing it. I can breeze into the house after my run and tuck right into dinner. It's pretty brilliant. Friday - This day is kind of a wild card. If it's a week that we've had our meet up, I try to keep it free so that we can have a day to chill. We still do our routine on our chill day, but I don't plan anything else. We might go to the nearby playground or do some other fun little project, but because the weekend after we've had our Wednesday meet up is usually followed by a full weekend, the kids really need some down time. If it's not the week we have a Wednesday meet up, this is the day I will plan something fun if we'd like. We might have friends over or go visit someone, or we'll do a museum visit or some other kind of outing. If we go somewhat far, we won't do our usual routine. If our activity keeps us somewhat close to home, we will fit in at least part of our usual readings. Saturday - Both girls now have theatre class, at separate times, on Saturdays. J takes them to these, as Saturday is my day off, or at least it is until late afternoon. Once a month we have children's vespers on Saturday, and that happens after Z's theatre class is over. I don't cook dinner on Saturdays, so we always eat something nice that someone else has made, which is something we can all look forward to. On Saturday, there is always dessert. Sunday - Our church does not have liturgy every Sunday, so we attend church on alternating Sundays unless there's a fifth Sunday in the month, in which case we attend two in a row. Our church is about an hour away, and liturgy is pretty long, after which there is a late lunch. So this takes up most of the day on Sundays that we attend. On the Sundays we do not attend, we mostly relax, and I make Ethiopian food, but if we want to do something fun as a family, a non-liturgy Sunday is the day to do it. Random Stuff We Work In - Both girls have things that the need to do a few times a week. Z is working on learning to type, and I want her to work on that thrice weekly, at least. I'd like for both girls to study French every day, but it's not always realistic to cram it in, so we aim for thrice weekly for that as well. Both have a couple of learning programs that they are doing either on an iPhone or a computer, and we are working on doing the thrice weekly thing for those as well. I am aiming to get some sort of check off system going so we make sure we get all these little things done, but we've been so busy this week with extra things that are not part of our usual routines that I haven't gotten that done yet. But it will happen. In the meantime, I'm committed to reminding them to do these things when they announce that they have nothing to do. I am sure I am leaving some things out, but this will give you an idea of how things work for us. As with the daily routine, we adjust as necessary. For now, this is working pretty well. We like it. We will carry on. While we don't have a daily homeschool schedule, per se, over the years we've worked our way into a routine. We adjust this as necessary, but most days contain these elements. There are some things that we do throughout the week, and tomorrow I'll write about what the full week looks like, with activities and lessons which are not daily ones thrown in. This is a quick rundown of the part of the day that is generally the same. 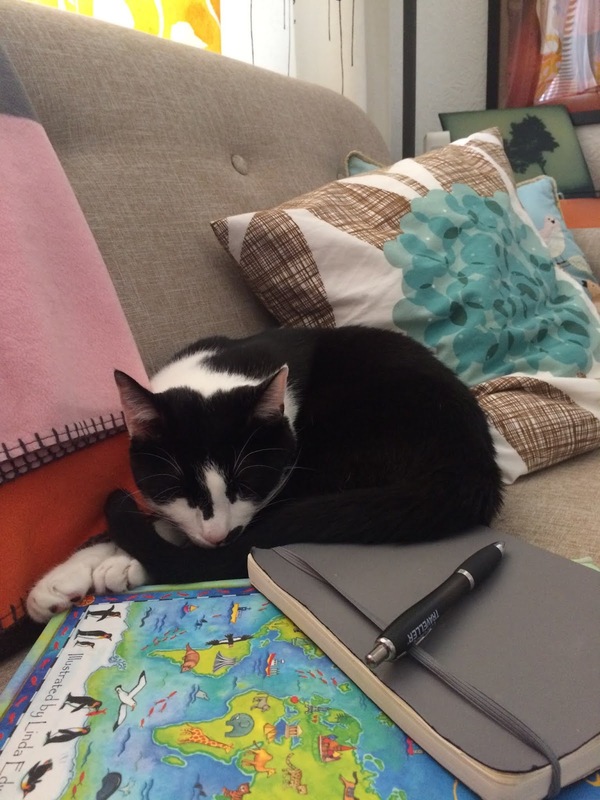 We do some schoolwork together, and other things my kids do on their own. I aim to get the part in which I am involved done by 3pm, as that is the time we visit our neighbor twice a week, and it also means that we won't get started too late. It is all too easy to stay in bed a bit longer or to keep working on a project instead of getting started with the kids' work. Some days it's worth it to do those things, but mostly I try to follow this routine. I usually wake up between 7:30 and 8am. I do not use an alarm clock, so this varies. After J leaves for work around 8am, I go downstairs and get a cup of coffee, then sit in bed with the cats for half an hour, checking and responding to messages and taking a glance at Instagram and the news. Sometimes E will wake up during this time, and other times she doesn't wake until I go in and turn off the girls' sound machine and open their blinds at 8:30, or if we've had a late night the night before, 9. Z is my heavy sleeper, and she always needs a bit of prodding to get moving. Once everyone is awake and somewhat upright, the girls will do a few little things on their own, sometimes playing together, sometimes cleaning up their things if they want to have non-educational screen time. During this time, we all grab something to eat, though our days of sitting down together for breakfast are largely over. I use this time to do any tasks that need attention that are computer-based, as well as get laundry started, and if we need groceries, I schedule them to be delivered during this time. Sometime between 10 and 11am, we get started with schoolwork. E goes first, and Z goes second. While each of them is having their lesson time with me, the other can either listen along or do education apps on old iPhones that they have access to. Z also has the option of doing typing lessons on my computer. With each child, I do two to three readings from literature, history, or science texts. During the readings, I will incorporate other appropriate materials such as maps or diagrams or manipulatives. We discuss the readings as we go along, and I note things that have piqued the children's interest so we can do further study. I try to answer any questions I can on the spot. Once we've done the readings for literature, history and/or science, we do two chapters from Life of Fred math. Mostly, I do these readings for each girl separately, but from time to time there will be a reading that would be good for both, and I do that at the end. For example, today I read King Lear to both girls once I was done with their individual lessons. During our lessons, one or all of us often become hungry. We each usually have a drink in the living room with us when we are working, and sometimes I also bring in a light snack. But if we need to stop for something more substantial, we just do it. I also find that I need small breaks between readings to rest my voice (and my brain if there have been lots of questions) a little bit. So we work that in, but not in a structured way, just as needed. Once each girl has had her turn working with me, they are welcome to pursue other projects or simply to play together. 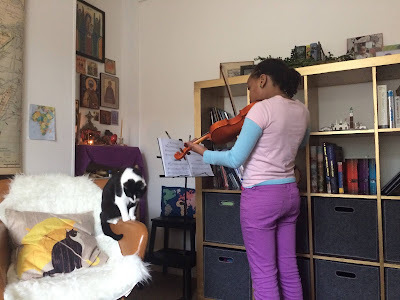 Z must practice her violin, and E is required to do work on one of her reading apps if she hasn't done so while I was teaching Z, but there is no firm time schedule for this; it just needs to be done before we have dinner. At this point, I work on whatever projects I have that need to be done. This might be cooking things to freeze (today I slow roasted more tomatoes to put in the freezer), working on organizing our homeschool meet up or coming up with a craft, or any other thing that needs to be done for our family or for my volunteer commitments. I suppose you could say it's a bit of free time. Free time is ended either when we have another commitment to attend to, or when it is dinner time. This varies by the day. Most evenings, we eat dinner together, after which we begin the slow march toward bedtime. There are baths at various times for various people, quiet play (which may or may not include something educational), and finally, we read a from a chapter book while the girls get settled into bed. We say prayers together, and if they want, J or I sit in their room with them while they fall asleep. The day is over, and we are ready to rest up for the next one. This week is the first week of our full on term time schedule. We attended our first home ed group last Wednesday and started our book work late last week, but extracurricular activities didn't begin until today. Now we'll add ballet, violin, and theatre classes into the mix. This week starts the real deal of what our school year will look like. It feels...busy. But it's manageable. 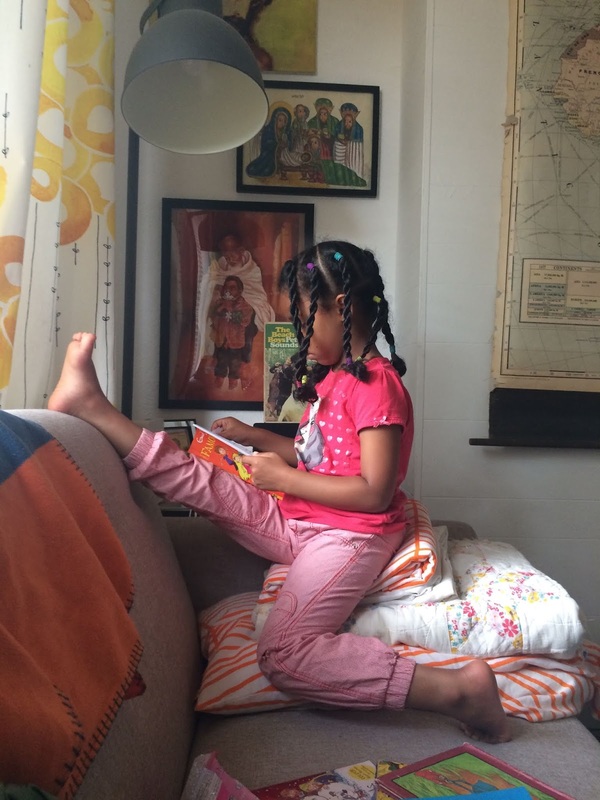 And I thought this would be a good time to write a series of posts about homeschooling. We've been doing it now for six years, and I'd love to say that I'm an old pro, but that's not true. We are constantly adjusting things and working to make home education the best possible experience we can for our kids. I wrote a post three years ago about why we homeschool, but as our methods have changed and grown along with our children, so have our reasons. Some of these are the same ones we had from the beginning, but others have emerged as we have gone along. Here are our current reasons that we keep the responsibility for our kids' education on our own shoulders. 1. Customized Education - This was always a good reason to homeschool, but it wasn't my top reason initially. It was firmly in the number two slot. Now it's the primary reason I see for continuing to do this. My kids can work at their own pace, in the way that works best for them. I can address both their strengths and weaknesses. They do not look at others and see themselves as ahead or behind. They progress as they are developmentally ready to do so. Within our curriculum, if we discover something that piques their interest, we can pause what we are doing to explore it further. Children are most motivated to learn things that interest them, and I can weave a lot of learning into the pursuit of their interests. 2. Low(er) Stress - Many people would argue that children need to experience stress in order to know how to handle it, but I think that's bonkers. I do push my kids to do their best, but I have no interest in introducing stressful situations where they are unnecessary. There is no high stakes testing here. In fact, my kids don't take tests at all, and I don't mark their work in the traditional way. They do written work, and I go over it with them after they are done, and they correct what needs to be corrected. I don't need to test them because I am working one on one with them daily, so I always know how they are progressing. Additionally, I make sure that I balance what is going on outside our education time so they do not become overwhelmed. Here in the UK, there is a mental health crisis among children. While I can't guard my children from every mental health difficulty - some of this is beyond anyone's control - I can give them a life that is as peaceful as possible, in which additional stressors are not introduced with good cause. 3. Flexibility - This used to be our number one reason for homeschooling. It is still important, and it could be said that numbers one and two are partly affected by this ability to have flexibility in our lives. 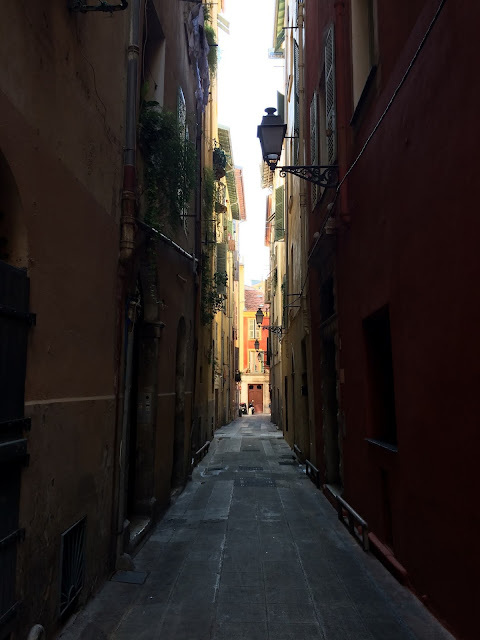 In some ways, our lives are less flexible due to both kids taking two extracurricular classes each, but we are still able to travel during term time, and we can visit family that is far away when we choose. I can choose to have them miss some of their extracurricular activities in favor of something more important. And we can structure our days as we choose. We seem to keep to the same workable daily and weekly routine, but we can change it up when we need to or even take a day off if we are all feeling burned out. But beyond that, we have flexibility with how our children progress through their education. They are never ahead or behind. If it takes a shorter time or a longer time for them to be ready to progress to the next level of education, or into a career, then that's okay. There is no one dictating when they need to be done with this phase of their learning. 4. Family Togetherness - We highly value our family time. At this stage of life, if the kids were in school, it would be really difficult to spend time together as a family daily, and this is a priority for us. Because we can keep a slightly later schedule than most due to not needing our kids to be up by a certain time in the morning, we have time every evening to be together. Most evenings we have dinner together. And in addition to time as a family of four, my kids also have a lot of time with each other. I have noted that when we are busy with activities for which they each go their own way, they have a harder time getting along at home. But when we have a normal homeschool week, they have time to work through their squabbles and figure out how to do things together that they both enjoy. With a five year age gap, this can be a challenge sometimes, but they continue to love to spend time together, even though their personalities and interests often diverge. 5. We Like It - Honestly, maybe this is the most important reason to do it. We like it. It's working. We've built up an amazing group of fellow home educating friends and are well connected with groups that organize activities so we can have the same type of museum visits and other field trips that kids in school can have. And we can do our own field trips, whenever we feel like it! My kids like the slow start in the mornings and how we can take time for them to pursue their passions. (Z is currently writing on three novels, for instance.) While I will admit that some days it feels like drudgery, most days I fully recognize what a privilege it is to pursue this together, and I wouldn't want things any other way. We have always said that we will continue to do this for as long as it is working for us. I feel pretty lucky that, right now at least, it is. I realize that saying "at last" when Monday was technically spent on holiday may seem a bit silly. But can we just agree that the worst part of going on vacation is getting back home? It took all of Monday to haul ourselves and our luggage from Nice back to London. We were worn out by the end of it, and then we jumped right into a busy schedule on Tuesday, with plenty to get done as the week progressed. I felt a lot like I was in an alley, walking steadily toward the light at the end. But we did it. I completed every necessary task I set out for myself this week. The kitchen is a bit of a disaster, and my desk and the surrounding area...well, let's not talk about it. But we got through our first homeschool meet up of the term (a big task for me since I am the one organizing and facilitating it), and we started our homeschool year officially, and everyone got fed and has clean laundry, and - much to my delight! - my autumn clothing is now in my wardrobe. Tomorrow, I'll have my usual Saturday break, and that will put everything right in my little home world. I am happy to give up my weekly break during a family holiday, but it does make a difference in my patience and my overall wellness, so it is good to get back to it. I've still got to send one more email and then get my kids to bed tonight, but tomorrow I'll be officially out of the weekday alley and into the weekend sun. Speaking of doing what's necessary, I am so excited about the necessary task I've got to do tomorrow. It's my favorite time of year, and by that I mean the time when I pull down the suitcase I stow my out-of-season clothes in and take out the autumn/winter ones. As I've mentioned before, autumn is my absolute favorite season, and this is partly because I love what I get to wear in autumn. In the photo above, you can see what it basically my autumn uniform. 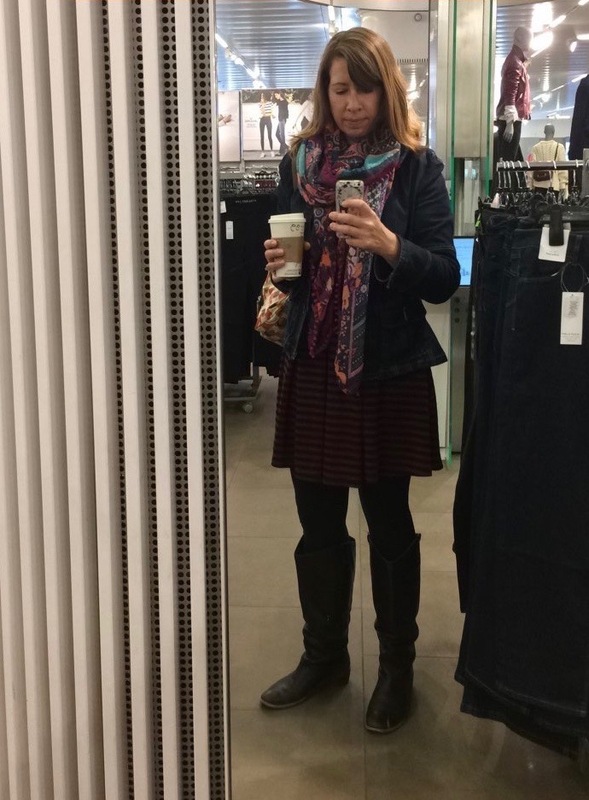 Dress, leggings, scarf, jacket, boots. With a coffee on the side (though now I carry a reusable cup). I honestly look forward to this task from the first day I feel sweat running down between my shoulder blades. I might get a bit sick of winter when it stays a long time, but it's nothing compared to how I feel about the misery of summer. I am ready for it to be over from the day it begins. With this summer lasting what seemed like years, I have been ready for a very long time. And here we are, on the cusp of autumn. I know that if I pack away my summer dresses, I won't wish I'd waited for it to get a bit cooler. It's not quite time for the jacket and the boots, but that time will come. And I'll be happy. Despite my efforts to get things done before the trip so that there wasn't too much to get done when we returned home, there was still quite a lot to do both yesterday and today. And there's more for tomorrow. Laundry still won't do itself, our tomato plant that grew itself grew a massive amount of tomatoes that I don't want to go to waste, and our homeschool group started back up today. I am trying to get everything done, but it never works out to get everything done. This is what I am finally coming to accept - there will always be something that doesn't get done. I can get quite stressed out about those things that don't get done. It feels overwhelming and awful, knowing that no matter how I try, I cannot magic up more hours in the day or more energy in my body. I don't like feeling overwhelmed and awful, so I'm working on shifting my perspective. Here's the bottom line: I don't have to get everything done. It would be nice, but it's not necessary. And right now, in my life, I need to do what's necessary, and not more than that. There are enough necessary things to fill my whole day, and so doing what is necessary is all I can do. I tend to get confused about what is actually necessary. Honestly, having a chronic heartburn problem helps out a lot with the self care end of things. I'm not going to call it something silly like "a blessing in disguise," but I will say it's a great motivator. If I want to feel good, or even just okay, I have to get enough rest. I have to make sure that I get some time alone on a regular basis. I have to eat in a way that works for me. So I do those things. But beyond that, I need to figure out what is necessary for our family life to run well. 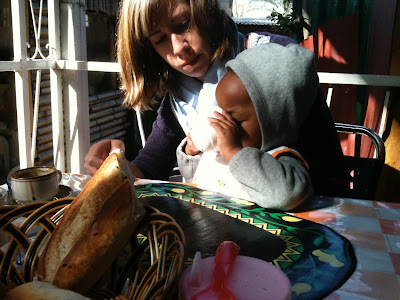 What is necessary always includes making sure that my kids are well cared for and that we all have things to eat. It includes making sure there's something weather-appropriate for each of us to wear. It includes scheduling the kids' classes and making sure that their education is accounted for. Aside from those things, a lot of things that normally would be considered necessary really aren't. And some things that seem unnecessary become necessary. 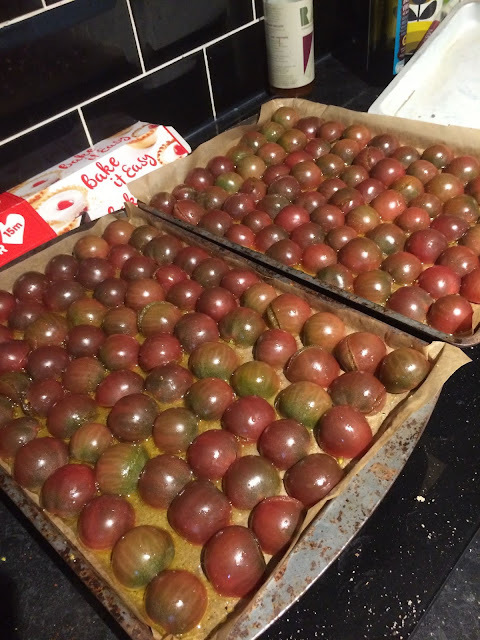 In the photo above, there are tomatoes which are ready to be put into the oven to slow roast. One might argue that it is not necessary to get those done today, after we'd already been to our homeschool group and gotten all the materials we take along back home with us and put away. One might say it could wait. But I knew that if I left it until tomorrow, I might not manage to do it, and I didn't want to accidentally waste a lot of those tomatoes. The idea of wasting them stressed me out. So I did it. On the flip side, do you see those crumbs under the pans holding the tomatoes? Those are not new crumbs. Some people feel that it is necessary to keep counters clean on a regular basis, but I don't. I'm not going to leave anything unsanitary in place, but when it comes to crumbs? Wiping those up is really not necessary when I've got a lot of other things on my list of things to do. Eventually, one of the kids or I will wipe down the counters. We'll do it when it becomes necessary. For now, it's not. Looking at things this way helps me a lot when we are entering into a busy season. It makes me feel like less of a failure. Instead of focusing on what I have not gotten done, asking what is necessary focuses me on what it is possible to do in the time that I have available. At the end of the day, I can look back and see that I have accomplished the necessary, and I know that the day has been a success. 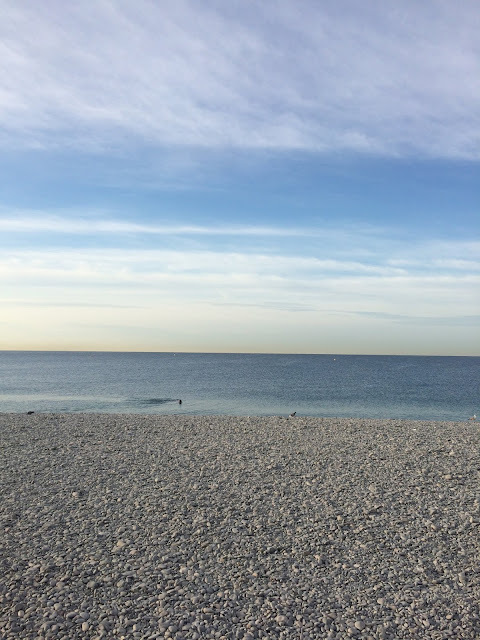 We returned very late last night from a week in Nice. I think my kids went to sleep at 12:30am, because far be it from us to sacrifice the book reading portion of our nightly routine, no matter what. Baths? Unnecessary. Brushing teeth? Quick is fine. But reading? That must be done in its entirety, or no one will sleep. There will be a revolt. I do not need revolts at midnight after being on trains all day. It harshes my mellow, and things got pretty mellow in Nice. I think this was the most relaxing trip we've ever taken as a family. In large part, this is due to the fact that both kids now can handle staying up late, because they will both sleep in. One day they slept until it was nearly noon. Amazing. Because of all the sleeping late, we didn't do as many things as I thought we might, and that is more than okay with me. I would've loved to go to the Matisse museum, but in the end it felt more important to take things slow. I needed slow. We all did. Now we are back to fast and busy. I am keen on finding a slow rhythm for our weeks, but it's not going to happen right away. This is the cost of taking a week of doing basically nothing, and of choosing the method of education we have chosen for our kids. Now there are schedules to manage, class fees to pay, planning and organising to do for the home education group I facilitate. We start back up with that tomorrow. Add to that the laundry which didn't get done before the trip and during the trip, the parcel we need to collect from Royal Mail, the overdue books that must get back to the library, the neighbour that needs to know we haven't forgotten her, the hair styles that need a little refresh. Today is full on. I'm off to handle it.